We are inviting people who use any sort of "service system" (and their allies) to come together and have a conversation. Sponsored by Human Intervention and HOPE4Change. Two sessions, Noon and 6 PM on September 18, 2012. What might happen if we left our credentials at the door? Professional caregivers, treatment teams and public servants want people to succeed in the larger world, but all systems have their limits. At their best, system boundaries keep clients safe. But sometimes they just ration out resources. And at their worst, systems trap and disempower the very people they are meant to benefit. 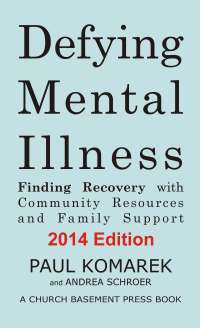 Paul Komarek, author of Defying Mental Illness: Finding Recovery with Community Resources and Family Support will lead a conversation about solutions within the expertise of ordinary citizens. What can we create in the larger world to help people achieve success in their lives? Free to attend. $50 with CEUs. Reserve your seat today.